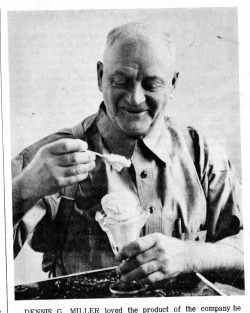 When Dennis and Minnie Miller grew tired of getting only two cents a quart for their milk, they decided to find a new use for it--and came up with Ice Cream! The Miller Farm Dairy started freezing ice cream in 1896, hand cranking each gallon and delivering it in town with a bicycle. From a shaft arrangement turning several freezers, the industry grew into the largest independent producer/manufacturer/retailer of its kind in the United States, making Eaton Rapids the "Ice Cream Capital of the World". Later Dennis Miller, pictured here on his 80th birthday, was featured in Ripley's Believe it or Not column in 1950 for eating a pint of ice cream every day for 50 years. He died in 1953 at the age of 83. The parlor also features the artwork/signs of Miller Dairy's Bryce Thomson. The parlor is located behind the Miller House (635 State Street, Eaton Rapids) in the former ice cream factory.